So here is a Fall version of the Inchie project. When I polled Grade 2 last June, asking "what was your favorite art project this year?" the Inchie project won hands down. The kids really liked the assembly line stations. Now each one of these squares is an art project in it's own right and you could easily just do a large version of any one of these. whew.....honestly just adapt and use what you have that's the whole point of this project. I like using 9 squares. A good number for a real nice collection/display yet not overwhelming. Now one thing I have talked about before with an inchie project is you don't have to do them all in one sitting. - you could set it up as a center, one square a day, or however many you have time for. 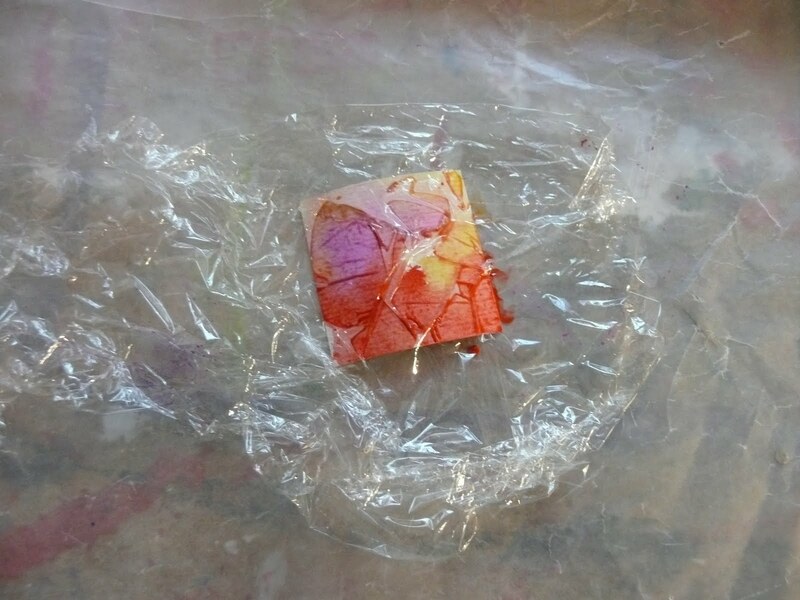 - give each child an envelope and as the squares are completed (and dried) just have them keep it in their desk until you are ready to mount. 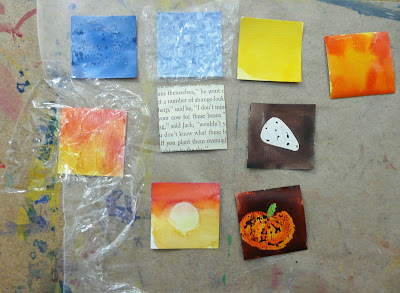 You can also do all the backrounds one session and then let these dry. 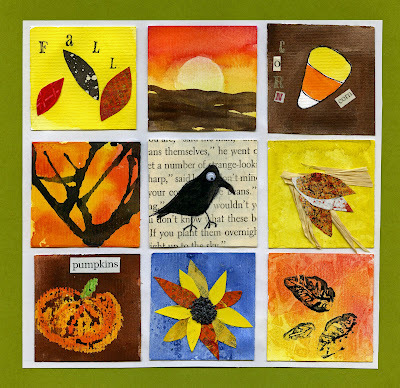 Now the first square is just a painted yellow background and some leaves cut out of colored/painted paper with FALL stamped on with. 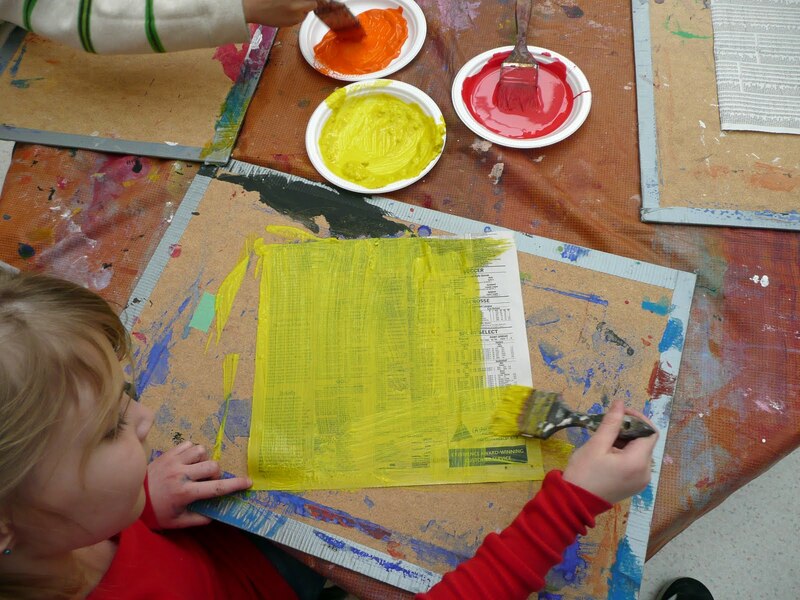 I keep a stash of painted papers.I always get a few of the kids to paint extra pages whenever we do a project. If you don't have a stash you can use colored paper, scrapbook paper, etc. 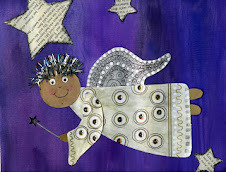 Now this is from a different project but you can see the little alphabet stamps I use. I get them from Michael's in the dollar bin (yes, seriously!) I have many many sets. 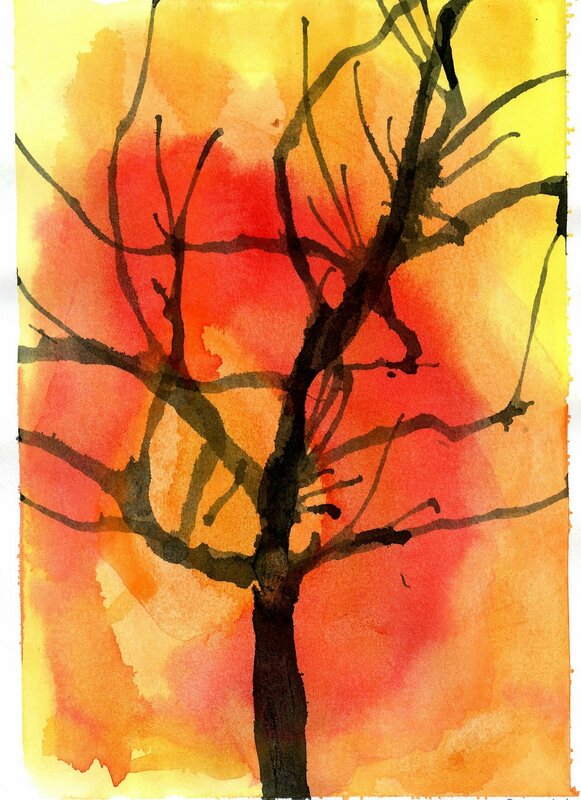 The next one is a sunset. You want to paint on some yellow and then some orange at the top. While the paint is still wet wrap the nickel in a kleenex and lift out a sun. When the sky dries paint in your horizon line with brown paint, leaving 1/2 the sun. You could do a large one similar to this project. 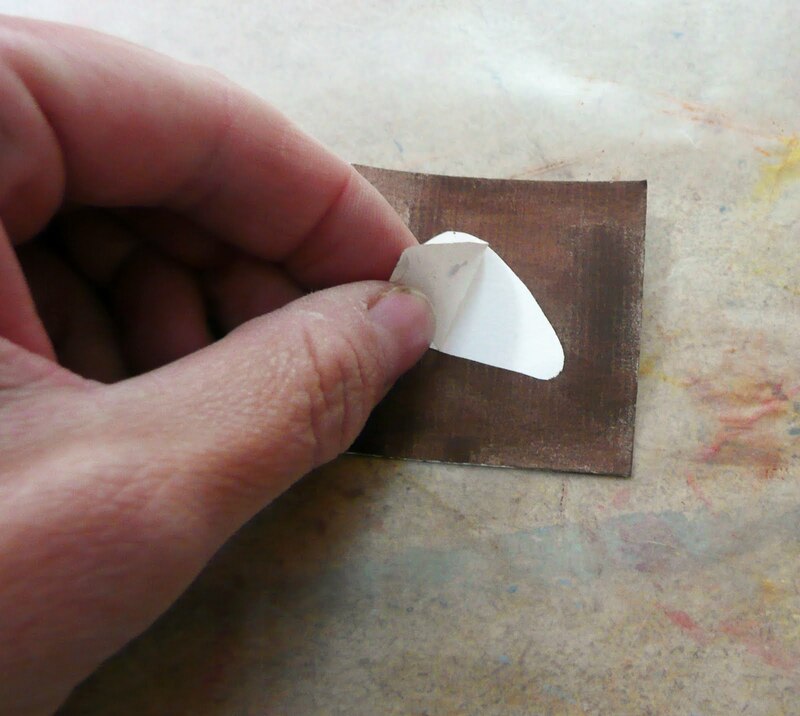 You could also use painter's tape cut into the shape you want. I chose candy corn, one of my favorite Fall indulgences, but you could do a leaf, pumpkin, apple, pear, squash, etc. Stick on your sticker and paint on your background color, go right over the sticker it will resist the paint. 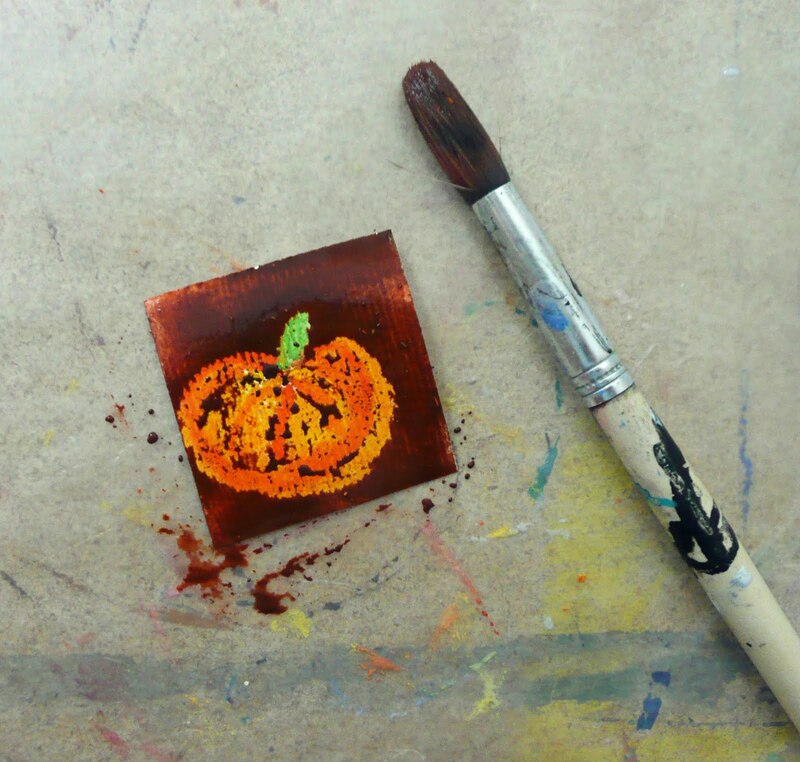 When the square has dried remove the sticker and color in the details, use a fine marker or pencil crayon to outline if you wish. You then can add stamps or cut out letters and words. For a class I'll print out words off the computer. Now the next square is just a little version of this project. Paint your square with a few Fall colors. With the square being so small just put a few drops of watery color at the corners and then shake the square to mix them just a bit. 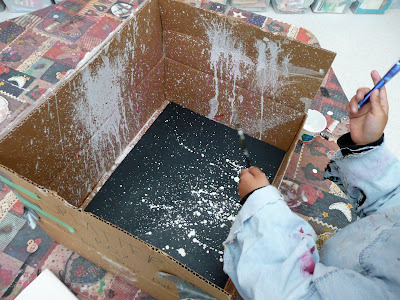 When dry put a drop of black paint on the edge and blow with the straw. Add some more drops along the trunk if needed and blow additional branches. 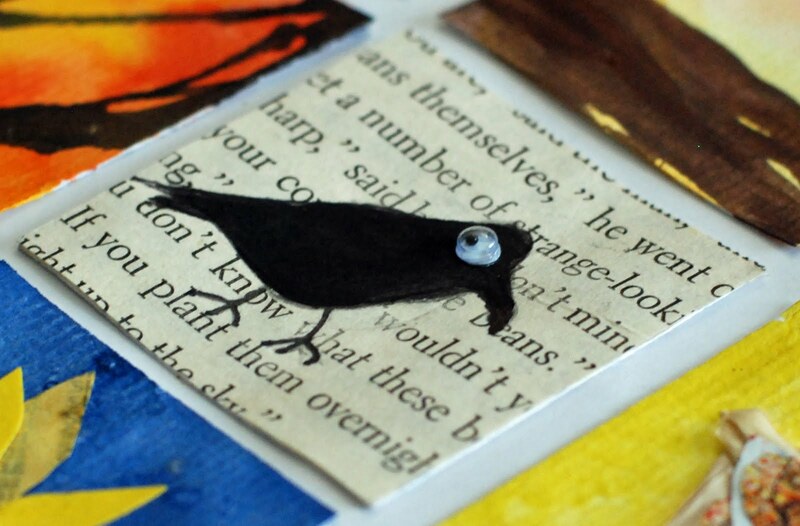 For the crow square, have the kids glue the inchie to an old book page. Trim off the excess and draw in your crow. I added a little googly eye. The little cobs of corn square is made from paper that has been splattered with paint in fall colors. At school I use a splatter box with the kids. This saves me lots of clean-up at the end. Cut out a few little cobs and the glue onto your background with a little bit of raffia. The pumpkin square is a pastel resist. 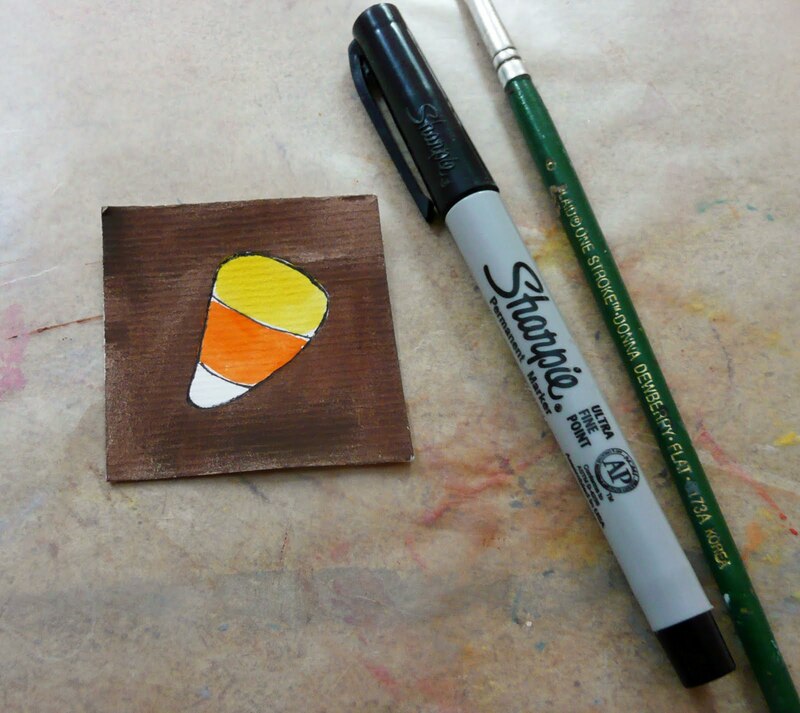 Draw on your pumpkin with oil pastel or wax crayons and then paint on a background color. The sunflower square is based on this project. Paint your background blue, cut out some petals and glue them on and then add a few poppy seeds for the middle. I then made a modelling clay/ plasticine stamp. 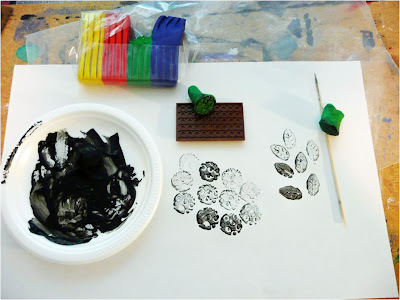 Kids love to make these stamps and we have tons of plasticine at school. Take a little piece, roll into a little log. For a leaf shape I taper the ends a bit. Pound one of the ends on the table a little bit to flatten the surface and then using a toothpick carve in the veins of the leaf. Put a little bit of tempera on a plate (flatten out the paint on the surface with a paintbrush) and then use your stamp. 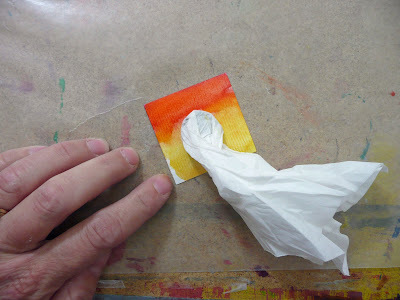 Stamp the first impression on some paper to blot a bit and then use the 2nd or 3rd impression. When you are done just wipe off the stamp and put the plasiticine in a plastic bag. 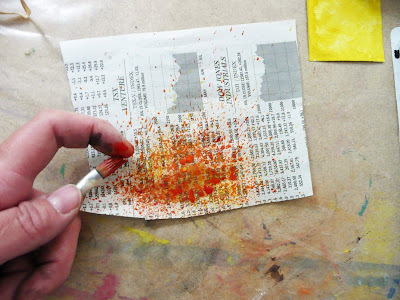 You can reuse it over and over again to make more stamps. 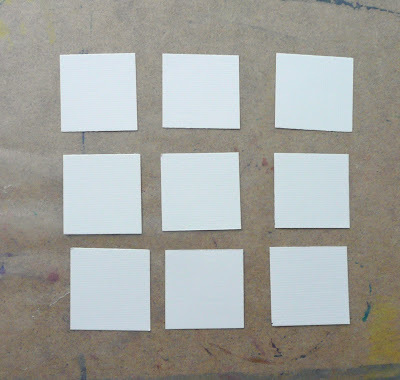 Once all your squares have dried mount in a collection on some colored paper. I double mounted this one. That's it. 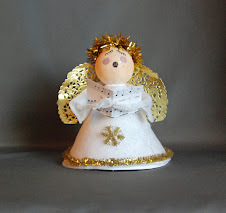 I love making these collections and I'm sure your kids will too! looooving these :)i'm going to do them with my third graders next! i'll be sure to link your page back! You are way too awesome, has anyone told you that lately? 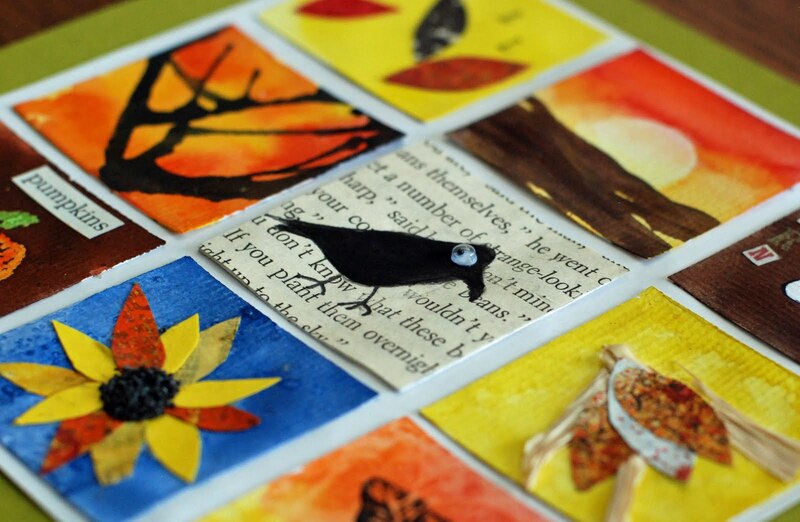 What a great project for fall! Thanks for sharing once again! I am really amazed at the amount of work you must have put in to prepare all those stations. While I don't teach art anymore, I still find this all very interesting. And to think you even have time to document everything and take pictures! I just love this! It is yet another project that makes me want to have my kids as students in your classes...ok, so I want to be in your class too! That's quite a process, but the results are stunning. 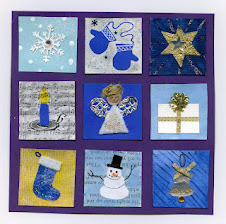 Hi Gail, first of all I'm so excited to see you on Craft Schooling Sunday and second of all thanks so much for sharing this great project with so many great techniques! Hope you'll be back again soon! these are so well done!!!! Love the variety of backgrounds, I learned a lot!!! Such a fun idea! I love that each inchie is manageable for me with my 5 and 3 year old daughters. Before tackling this project, the 5yo and I made a inchie collage of lines she learned for kindergarten art. We did 1" squares and did 12 different lines. She loved it. We double mounted it and it is fantastic. Thanks for the inspiration! I just found your blog today and I am so thankful! 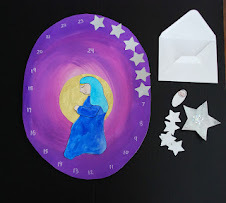 I am a homeschool mom and am trying to teach art. I can teach art appreciation b/c I love art history and (most) art in general. Unfortunately, I can only draw stick figures and poorly at that. Your blog has given me some great ideas and your article on open and closed paintings is awesome. Thank you! Gail, I LOVE THESE! I am doing a form of this with my 5th graders and they are having a lot of fun. At first just the work inchie made them giggle beyond belief. After they got over inchies they loved all the techniques they are using. I am doing 3" squares and only 6, but I just wanted to tell you that we LOVE this project. I will have to send you a picture of a finished product. :) Thanks for such a GREAT blog! I wanted to thank you for inspiring us with so much artistic beauty...I did my own version of Fall Inchies with my daughter during the month of October, and I am not sure who had more fun-me or her!